Milkman yoghurt is a tasty and colourful celebration of all good things Ugandan. Our love for fun, vibrancy, tastiness and good health comes to life in yummy flavours packaged beautifully to give you a fulfilling and heavenly experience. 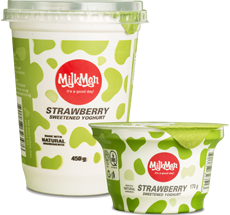 Milkman yoghurt uses natural ingredients and scientific precision to attain that fruity taste and perfectly smooth texture we all look for but almost never get. It comes in two different sizes – 450g and 170g and is UNBS and HALAL certified.